Unfortunately both our sessions are currently full. Please contact us is you wish to be added to our waiting list. Little Angels is our Baby and Toddler group here at Oundle Road Baptist Church. It runs every Monday and Tuesday morning (term times only) and starts at 10:00am until 11:30am. 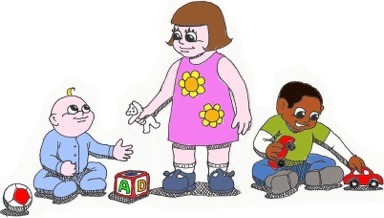 Our aim is to provide a warm, caring environment for children under 5 and their carers. We have a variety of toys and activities and there are refreshments for everyone. There is a charge of £1 per family per session, to help us cover our costs, and anything left over goes to buy new, good quality toys. We run our mornings on a first come first served basis for up to 20 adults, this is limited to keep the sessions safe for the children. Please email us, or contact us on the church office telephone number 568877 (answer phone, but we will get back to you) if you have any further questions.